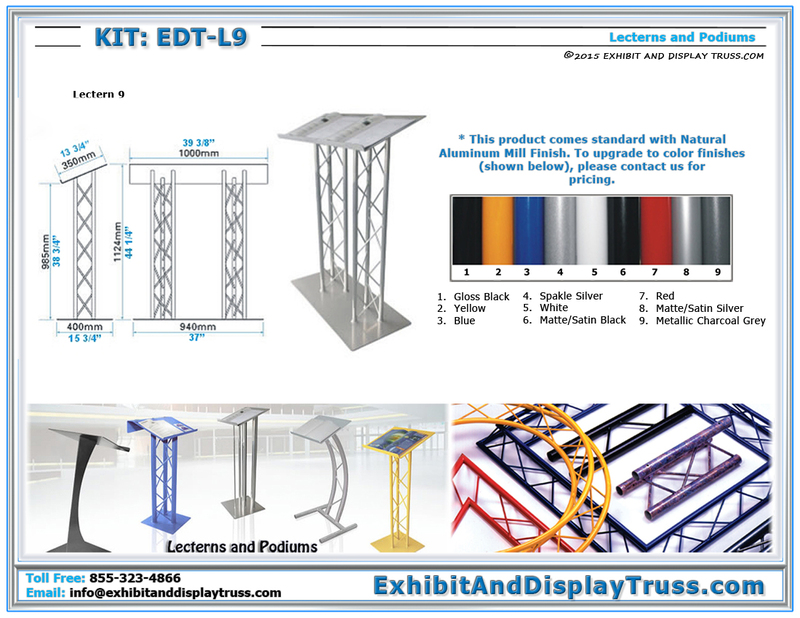 The EDT-L9 Lectern 9 is a clean, simple and lightweight aluminum truss podium with a tilted top and an extra large base plate for extra stability. What makes this metal podium so desirable? Like our Lectern 1, this presentation lectern uses 9″ wide aluminum truss. This one however uses 2 pieces of aluminum truss creating a double lectern with a large podium top to keep presentation and speech notes. Lectern 9 is perfect for on the go lectures and speeches because of its portability. This is one of our premium lectern pulpits. The EDT-L9 Lectern 9 is perfect for church sermons and events, speeches, schools, weddings, trade show tabletop exhibits, and other public events. This lectern uses an open and contemporary design which offers a contrast to bulky looking podiums and pulpits. Our presentation lecterns and podiums are available with either linear truss or curved truss. We also offer multimedia lecterns, which provide a space for pamphlets and lcd tvs. Because of their lightweight, aluminum truss public speaking stands are easily portable and easy to transport, making them an ideal choice of speaking furniture at a variety of events. This podium stand comes standard with natural mill aluminum. Why is aluminum truss a good choice for podiums and speaking stands? Aluminum truss is for constructing lectern, podiums, pulpits and other types of speaking furniture. Aluminum guarantees lightweight without compromising stability and durability and is recyclable. Traditionally, wood, plastic, and acrylic have been used to construct lecterns and podiums but these materials are heavy, bulky, and not easily transportable and are not as durable when being moved constantly. Aluminum truss lecterns are also portable and easy to transport. A lectern is a free standing piece with a space to put paper and notes. Presentations and public performance have used lecterns, podiums, and church pulpits for centuries. Common places to used lecterns are churches, places of worship, schools and trade show tabletop displays. These have been made from wood and other materials such as plastic or acrylic over the years but these style lecterns and podiums are heavy and damage easily while being moved on and off stages. Choose from a wide variety of functional and decorative lecterns, podiums, and aluminum truss pulpits today! Available as linear and straight versions so with curved aluminum truss.